For the past few weeks, I’ve been hitting up all the thrift stores for furniture and other accessories. Without fail, I usually find at least one bargain wherever I go. Here’s just a sample of what I’ve accumulated in the past week. 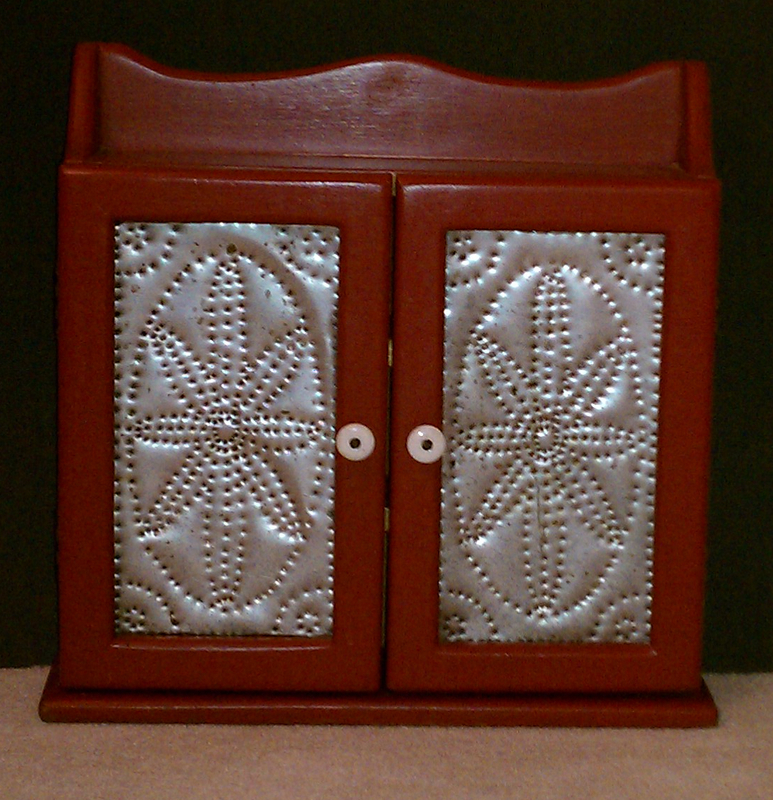 This is a cute little tin-punched cupboard I found at a church thrift store. It just needs a little TLC and it will look great! 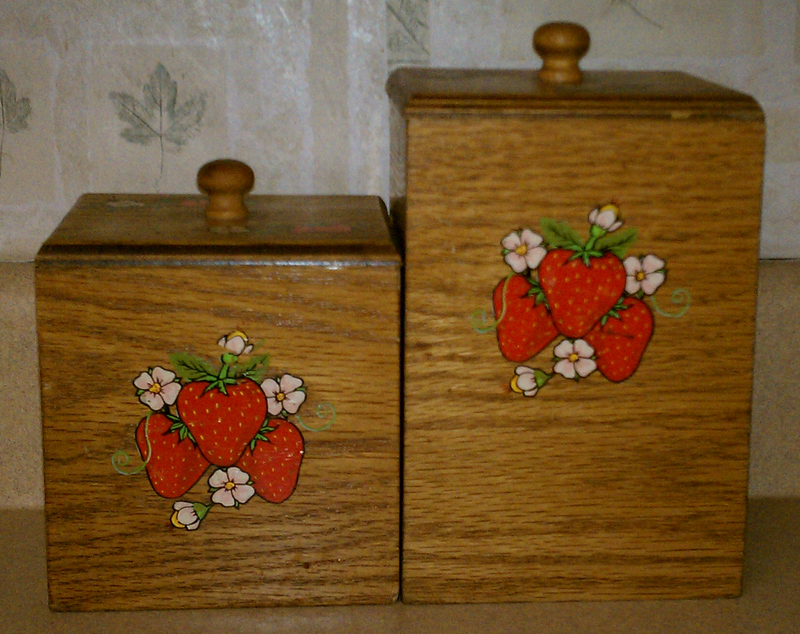 I couldn’t resist these little strawberry canisters. My grandfather loved strawberries (and so do I) and seeing them always makes me think of him. This is a sewing table from the “Standard” company. 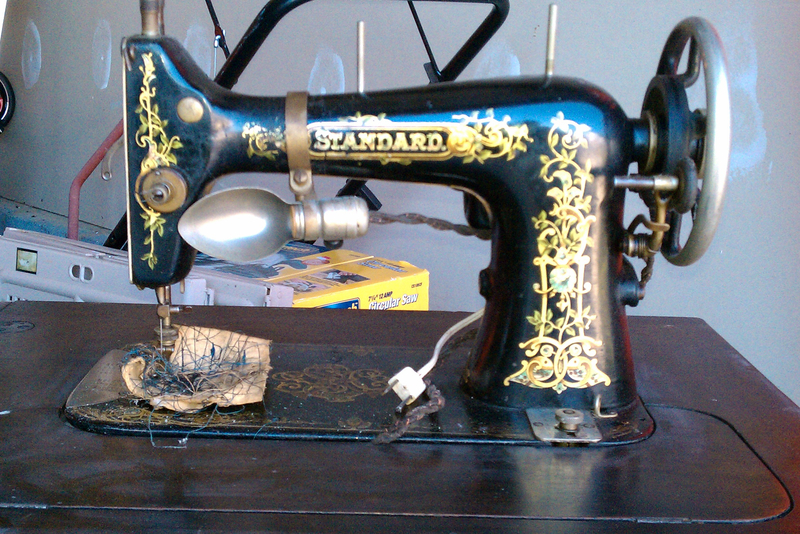 This one probably dates around the early 1900’s (Standard was eventually bought by Singer). 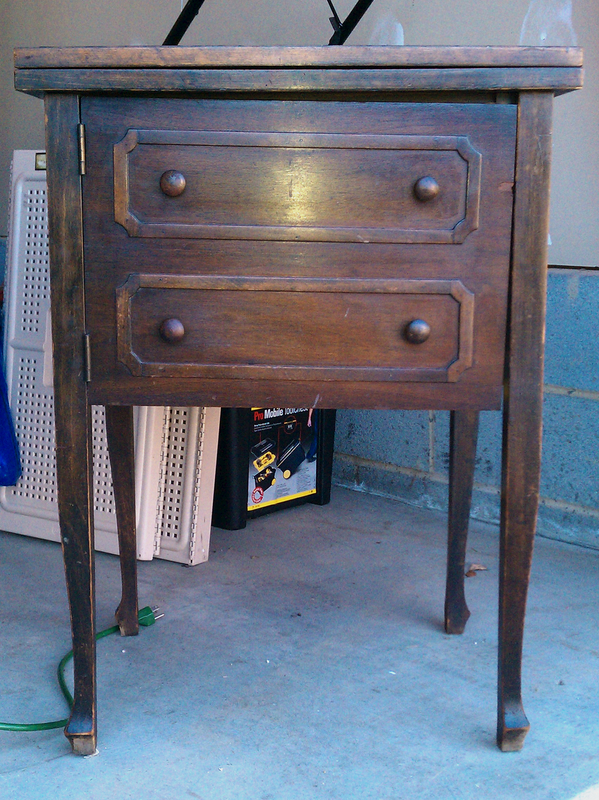 I don’t need another sewing machine – but the cabinet makes a nice end table. Here it is opened up. You can see that it has a test piece of fabric in it from at least 40 years ago (I know this because the woman I bought it from had it for 40 years and never used it as a sewing machine). 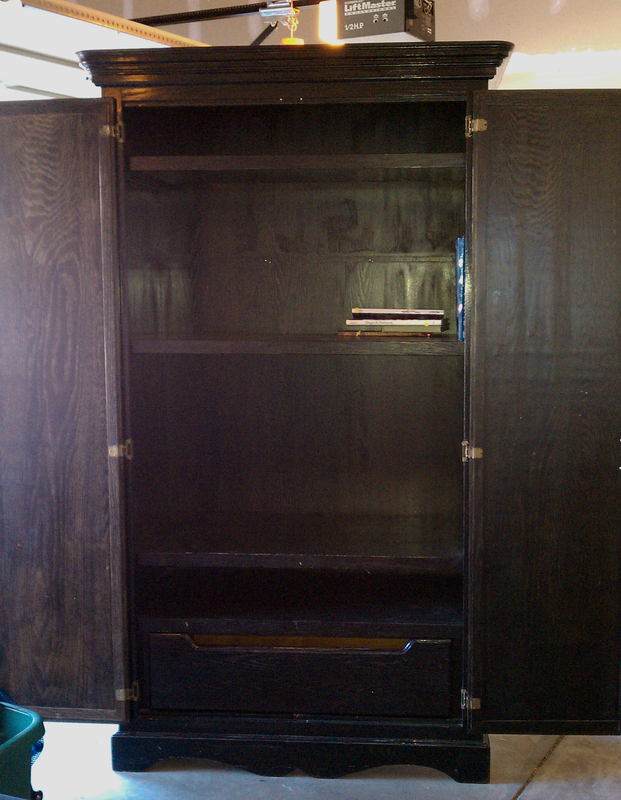 This is a wardrobe that is about 12 feet tall. My decorator said I needed some bigger/taller furniture for the bedroom to add variety. This is exactly the kind of piece I pictured in my head. It’s nice solid wood (oak or some other hardwood), and really just needs to be cleaned up a bit. Here it is opened. My husband will get to use this for his clothes. Eventually, when I get more quilts, I will probably take this and use it for quilt displays (which means my husband will have to find something else for his clothes). 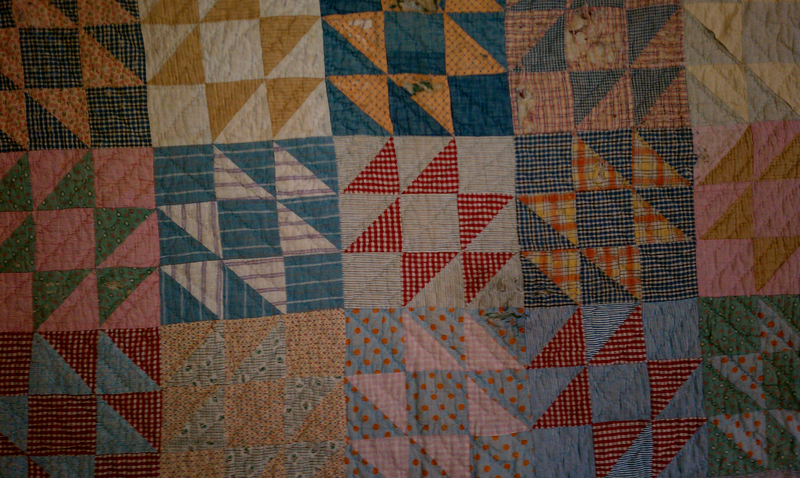 Speaking of quilts, here is an antique quilt I found at Goodwill for $10! It is in pretty sad condition – lots of holes, but there are several places where there are no tears. I haven’t yet decided what I will do with it. I love the colors and the pattern. I was so excited when I saw this. As I paid for it, the cashier said – “I didn’t think anyone would buy this.” I said, “I can’t believe someone didn’t buy it already!”. That’s all for now – thanks for looking! Meanwhile, back to sewing for me :). 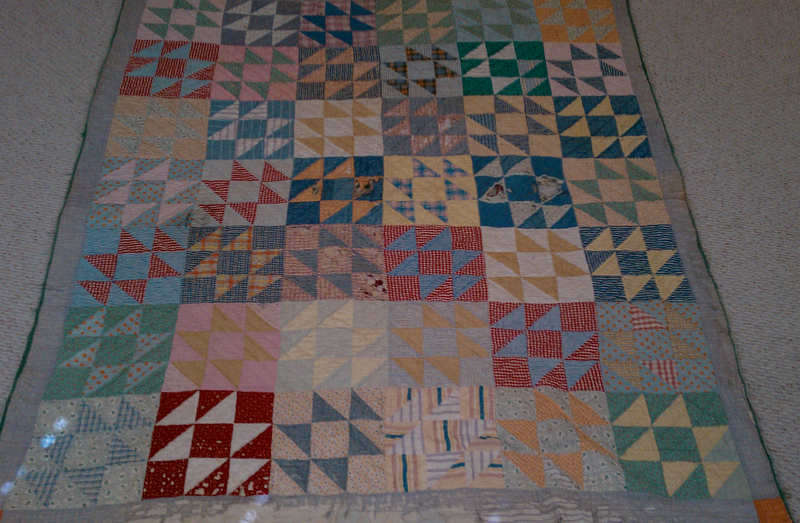 I found a beautiful antique quilt (only 1 or 2 hole) at a garage sale this past summer – the man said he was pretty sure it was made by his wife’s grandmother (why they heck would you sell something like that?) I thought they were just a little bit crazy to get rid of it, but even more crazy for what they were asking – $1.00 – yep, that’s it, can you even believe it? I felt almost guilty as I walked away with my new treasure – but at least it fell into the hands of someone who will indeed treasure it for a long time to come and probably pass down in my own family one day. Keep up the bargain hunting! Wow, what a great story for you. I can’t believe they were only asking a $1 for it!!! A woman who owns a quilt shop recommended Orvus soap to clean old quilts. She said to use the bathtub and gently soak the quilt to get out as much dirt as you can. You might need to rinse it 5 or so times, but she said it will really help brighten the colors. I am going to take this quilt into her so she can see how damaged it is. She might not think it should even get wet (it seems very fragile, like it could fall apart if it got wet). Good job Heather!!! Love that you’re accumulating all those bits and pieces. It will make it so much fun to pull it all together. Your decorator appreciates your hard work! And I love the needle book by the way. Thanks Sharon! I am hoping to get the painting done by the end of the year so we an start arranging everything! You are really going to town with your purchases. Do you remember the cabinet Aunt Frances bought that she stripped down through about 15 coats of paint? 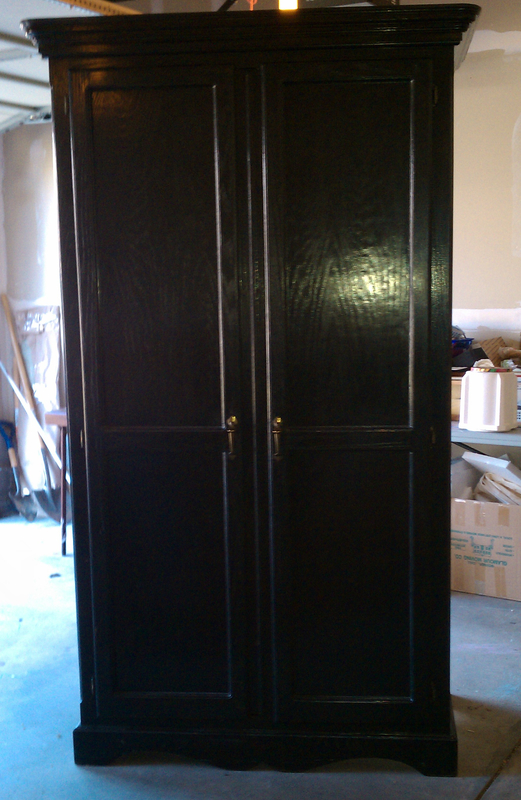 When she was finished, she discovered that the doors were beveled. When she started she didn’t even know what kind of wood she had until she was done. It was the big cabinet that she kept her most prized dishes. In fact, the tea set she gave me.